Slow posting during the Thanksgiving break. Just a brief follow up on my recent post on Argentina. By a relative small margin the right wing candidate, Mauricio Macri, won the election. As noted in the previous post the most dangerous result would be an attack on the human rights policies followed by the current government, that have led to jail more than 400 human rights violators (noted that several were acquitted by lack of proofs as it should happen in a civilized society; so this was not witch hunt). La Nación, the main conservative daily, that benefited economically from the last dictatorship and supported it, had an editorial demanding an end to 'revenge.' They called the left of center militants the true terrorists of the 1970s, even though the vast majority had committed no violent crime (and even those that did commit crimes should have been prosecuted according to the law, not tortured, and summarily executed). 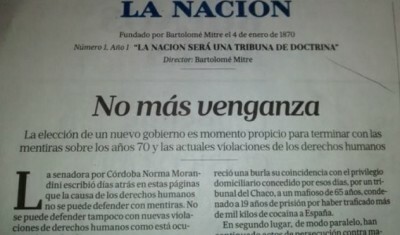 Macri has suggested that he will not stop the judiciary system from prosecuting human rights violators. But he made it clear that this will not be part of government policy. Devaluation is in everybody's minds, and is likely to happen, although no run on the peso for now. There is an external restriction now (and for the last couple of years, but as I noted before there is no external crisis per se, so a maxi-devaluation is a question of choice, not necessity). Also, while it is true that the neoliberal policies of the 1990s are back with the new administration, it is worth remembering that the conditions now are very different than back then. The neoliberal turn in Latin America and Argentina in the 1990s followed a lost decade, with low growth, high unemployment and even higher inflation. Worse, ideologically the collapse of the Berlin Wall and the Soviet bloc had given legitimacy to neoliberal ideas, and the notion that history had ended. Only market friendly policies worked. Will post more on this later. Keynes had a profound influence on Prebisch in terms of the diagnosis about the main failures of market economies and the need to pursue pro-active and anti-cyclical policies. 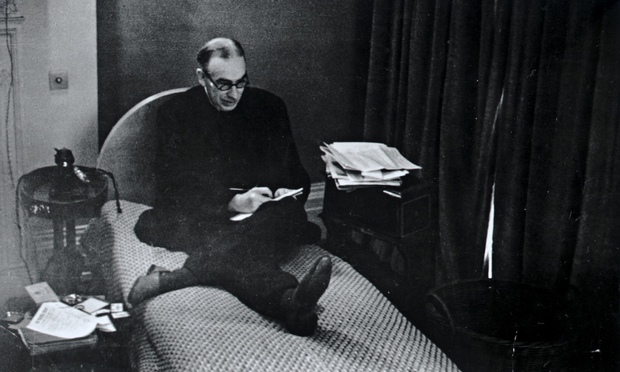 However, Prebisch was critical of some aspects of Keynes’s General Theory of Employment, Interest and Money, in particular on the theory of interest and the multi- plier. His attitude can be explained by a difference in the object and method of analysis. 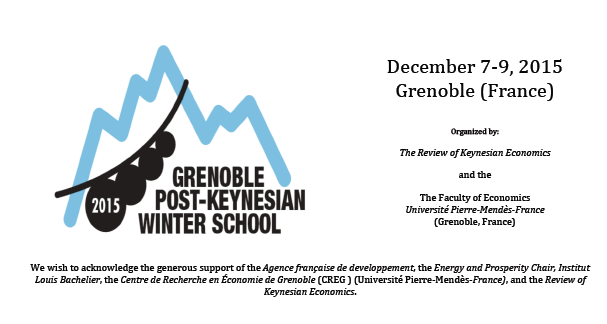 Prebisch’s interests focussed on dynamics and the cycle, themes that were peripheral to Keynes’s central message. Prebisch’s Keynesian influence and his rejection of some aspects of Keynes’s magnum opus explains why at the same time that Prebisch is often described as the Latin American Keynes, he is portrayed as concerned mainly with the long-run development problem of Latin America and without proper consideration to demand factors as fundamental determinants of output and employment. I had discussed before the meaning of heterodox economics. I suggested a definition based on positive contributions (rather than as a critique of the mainstream) and based on concepts rather than schools of thought. In my view the two principles that were central for defining heterodoxy were the Principle of Effective Demand (PED), based on Keynes and Kalecki's ideas, and the idea that distribution is the result of class conflict, which in my view is best expressed in Sraffa's recovery of the surplus approach. And I suggested that several authors within various schools of thought (Post Keynesians, Marxists, Institutionalists, Sraffians, Feminists, Ecological economists, Structuralists, and even some Evolutionary or Schumpeterian economists) could probably accept both propositions (not Austrians, which are a fringe version of Marginalism, and as a result not an heterodox school per se). In that sense, there could be a view of heterodoxy as not necessarily fragmented set of Schools of Thought. However, it is a different proposition to suggest that something like a consensus between heterodox schools is really emerging. That I actually doubt. John King suggests that this would be Fred Lee's position in his new book Advanced Introduction to Post Keynesian Economics (there is no direct quote, but I always interpreted Fred as suggesting that a more cohesive heterodox approach was possible rather than it was actually taking place in reality, but I might be wrong). In fact, it is my view that, in general, not only heterodox groups, which by definition tend to be small and often concerned with specific topics, but the mainstream is quite fragmented. On macro issues, even with the New Neoclassical Synthesis, there is a lot of disagreement between New Keynesians and RBC types, particularly on policy issues. So it should not be surprising that heterodox groups are quite fragmented too. Sometimes the fragmentation within the mainstream gives the false impression that some groups are breaking away, or on the edge (see my view on that here). And it is not just fragmentation, but also confusion. Even in the mainstream there is lack of understanding about the meaning of the mainstream (see here for example). So it should not be surprising that, given the fragmentation of the heterodoxy, several misconceptions arise. Sraffians are particularly vulnerable to this since Sraffa wrote so little, and even though his Production of Commodities is not a difficult book to read, it is one that has been often misunderstood. Marc Lavoie has responded, from a Post Keynesian and friendly standpoint, to some of these misconceptions (the fact that some people consider Austrians heterodox, but are not certain about Sraffians speaks volumes about confusion among heterodox groups too). Yet, I was a bit surprised by some of the misconceptions in John King's book. He says that: "There is no role in Sraffian models for fundamental uncertainty, money or the principle of effective demand." In the quote he suggests that this is the position of Hart and Kriesler (2014), but if he disagrees he does not say anything. So it is safe to assume that he concurs. He complements this by arguing that: "since the relationship between the wage rate and the rate of profit in Sraffian models is monotonically declining, it is difficult (if not impossible) for the their models to incorporate a 'wage-led' growth regime." Hm, were to start. a steady and continuous rise in real wages along with the consequent steady and continuous increase in consumption can serve to instil in entrepreneurs a confidence in the continuous expansion of the market for their products, inducing them to undertake investments and increases in employment and output that will in turn help to raise final demand." So yeah the economy is wage-led. Actually, in Garegnani's debates with Marxists, with Joan Robinson and other authors on the causes of long run growth, he could be seen exactly as taking the position that profit-led regimes are not possible, in the sense that he understood that firms would not invest because of a higher rate of profit. Firms are interested in adjusting capacity to demand, and to maintain a normal level of capacity utilization. Also, one should note that Garegnani wrote his paper in the 1960s under the direct influence of Sraffa, who might also have understood the idea of the accelerator. That is why Franklin Serrano is correct in suggesting the supermultiplier is Sraffian. Not only Sraffians have effective demand, they do in the long run (not in the short run as a result of imperfections). Two things are important in this context. First, in Sraffa's price equations, which uses the method of given quantities developed by classical political economy authors, imply that there is class conflict, and an inverse relation between the real wage and the rate of profit. However, in a theory of the determination of output in the long run, output by definition is not given and the effects of income distribution on output might be ambiguous, even if the demand regime is wage-led (for example, higher wages might lead to loss of external competitiveness, and lower exports than more than compensate the increase in consumption associated to higher wages). Second, as I noted on my previous post on Garegnani's 1960s paper, the Sraffian project was the revival of the classical theory of distribution, concomitantly with the extension of the Keynesian Principle of Effective Demand to the long run. On the absence of money in the Sraffian system also a lot of ink has been wasted. In his Production of Commodities Sraffa famously suggests that it is the rate of interest, as determined by the monetary authority, which is the exogenous variable. So prices and real wages are determined for given technical conditions of production and the long term interest rate as set by the monetary authority. Pivetti referred to this as the monetary theory of distribution. So monetary policy has important distributive implications, and this view is perfectly compatible with Keynes' views on a normal, conventional and not psychological, rate of interest. It is also compatible with endogenous money views, that hark back to Tooke and other Banking School authors. There is money, and not in the sort of Monetarist way in which the central bank controls its quantity. Finally, on uncertainty. True for Sraffians uncertainty is not central for unemployment (one in three), yet that does not mean is completely irrelevant or that it does not play any role. Here it is important to note that any good discussion of uncertainty suggests that the one that is central is the uncertainty about future demand. See for example Davidson in this example. So the problem is lack of demand. Autonomous demand that is. And that works, as it should, with the supermultiplier. Most stories about this were comparisons with Rick Perry forgetting which government agencies he would close (including the NYTimes). But the real story is he wants to close the IRS, the Housing, Energy and Commerce departments (yes he doesn't know how to count to 5). So presumably there will be no income tax, or how in hell is that going to be managed? How is tax collection better managed without an agency dedicated to that? Glad he doesn't want to close the whole Treasury Department. It is as if he wanted to reduce crime by eliminating the police (and that would be a less crazy idea than the closing the IRS, although reforming the police might be a more reasonable one). The level of crazy in the GOP is out of control. PS: If you close the Commerce Dept. what would happen to the BEA? Would it be closed too? So no more national accounts? In all fairness no macroeconomic data would help President Cruz avoid scrutiny for his crazy policies. And if you think he is not serious remember that Congressional Republicans have effectively closed the Export-Import Bank (Ex-Im Bank), whatever you think about that government agency. 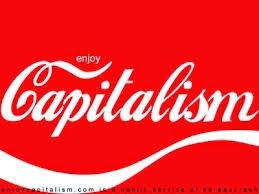 From CAPITALISM the documentary by Ilan Ziv. In this short clip a discussion of comparative advantage and its limitations, with Pascal Lamy, Robert Boyer and yours truly (many others in this chapter, including Geoff Hodgson and Ha-Joon Chang). The Mexican secretary of finance that appears in the video is actually NOT talking about the Ricardian model of trade, which at least given its assumptions is logically correct, but about the neoclassical or Heckscher-Ohlin-Samuelson (HOS) model that has significant problems (see here). I should note also that in my view Ricardo should not be seen as Robert Boyer suggests (not shown in the video above) as a precursor of mainstream neoclassical economics for his role in the development of formal models. Formal models can be marginalist or not, and actually Ricardo's ideas led to Marx. As I noted in my interview (in parts that do not appear in he documentary), Ricardo was the first economist to formalize the idea of a distributive conflict between capital and labor, once the Smithian notion of the adding up theory was criticized. I joke that contrary to Samuelson's view according to which Marx was a minor Ricardian, one should think of him as a major Ricardian. And in many other ways Ricardo's legacy has been misunderstood (without even discussing Barro's Ricardian Equivalence). But it is well-known that reality has a liberal bias, so facts do not bode well for these GOP talking points. The common strategy in these positions is to purposely misrepresent the truth with statistics (Disraeli’s third kind of lie, as per his dictum that there are three kinds of lies, lies, damned lies and statistics). The corporate tax rate is indeed high in the US, but as noted by the Center on Budget and Policy Priorities (CBPP): “The U.S. corporate tax code includes a host of special provisions that significantly reduce the taxes that most corporations owe… Largely because of these preferences, the corporate tax base is very narrow.” So the tax rate is high, but corporations don’t pay much. Number two is the Holy Grail of supply-side economics. But at this point it should really be relegated to the annals of crazy science. There is no shred of evidence, as noted by Mark Thoma. By the way, all the evidence on investment is that it responds to the level of activity, the so-called accelerator. While the correct number, again according to the CBPP, would be more like 40% of people don’t pay taxes in normal times, it is still the case that the vast majority does pay taxes. Not income taxes, but payroll and sales taxes, which are, by the way, regressive. And they pay state and local taxes too. For the vast majority of the labor force payroll taxes, not income, is the biggest burden on their paycheck. And immigrants do pay sales taxes, and often payroll taxes too. Alan Blinder has noted (subscription required; or read Jared Bernstein here) that the complexities of the tax code do not come from multiple tax brackets and that a flat tax rate would not simplify the tax system, besides being regressive. Complexities derive from what is defined to be taxable income instead. Finally, you might think 5 it’s a typo, since Republicans are not for Big Government. So they would NOT suggest that lower taxes can finance big government. In fact, as shown by Jeffrey Frankel here (scroll down for his talk, and go here for more recent data) every Republican president since Ford has increased spending and deficits while every Democratic president has done the opposite, and that includes Obama after the fiscal package passed in 2009. So they are for big government (for corporations and war), and the idea is that cutting taxes would still allow to fund for that. It would certainly lead to higher deficits and debt, which of course they would only favor during a Republican presidency. 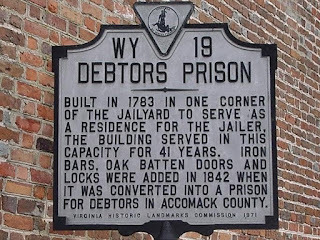 But arguably that’s their point, to increase debt so that they can claim that government spending must be restrained, and privatize Social Security. PS: Mike Isaacson of the great blog Vulgar Economics reminded of the death tax. And I'm sure I missed other myths too. I'll be teaching a couple of classes on financial crisis and inflation for the students of the masters in economic development too. 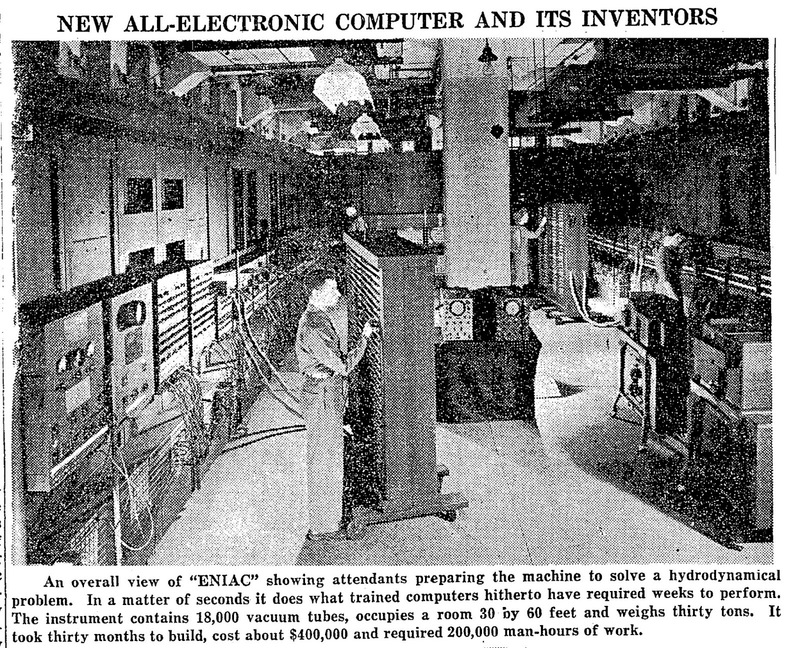 ENIAC (Electronic Numerical Integrator and Computer), the first functional computer, was finished in mid-November 1945, just after the end of World War II. Developed for military purposes and financed by the war effort, it is probably the most important technological innovation associated with the state during the war, beating that other project, the atomic bomb. This is the quintessential example of the developmental state or what Mariana Mazzucato has more recently called the entrepreneurial state. And yes, the internet, which allows you to read this in your computer, was also funded and developed by the state (see ARPANET). True, conservatives are right (did anybody saw the debate yesterday? ), without entrepreneurs unimpeded by government regulations (what did they want? drown the state in a bathtub?) there would be no progress. This computer/internet business must be a conspiracy to spy on you. 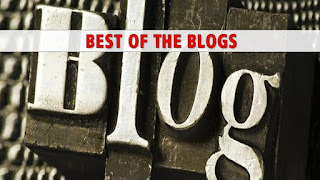 Since the blog is now almost 5 years old, and several issues have been discussed before, I decided once in a while to post links to old entries. This one actually with two posts one from Triple Crisis, which started the year before, and in a sense pushed me to start my own blog. Since yesterday the Donald had an op-ed in the Wall Street Journal on currency manipulation here my two cents on how much China is really a problem. On Sunday, November 22, Argentineans are going to the polls. The two candidates represent significantly different projects, and not just in economic terms. On the one hand, there is Daniel Scioli, governor of Buenos Aires, ex-vice-president during Néstor Kirchner’s presidency and (even if not completely trusted by those closer to President Cristina Fernández de Kirchner) the candidate of continuity. On the other hand, Mauricio Macri—wealthy scion a business family with origins as public works contractors, president of a popular soccer team, and currently mayor of the city of Buenos Aires—is the main opposition candidate. The election takes place during uncertain economic times. The Argentine economy grew spectacularly from 2003 (the year after the default) to 2011, including a speedy recovery from the global economic crisis in 2008-9. However, since then the economy has basically stagnated, and inflation has been high. As a result, real wages—which grew fast during the boom years, leading to a reduction of inequality—have now essentially stagnated. And that probably explains to some degree Macri’s rise in the polls and the surprising tight race in the first round of the election. 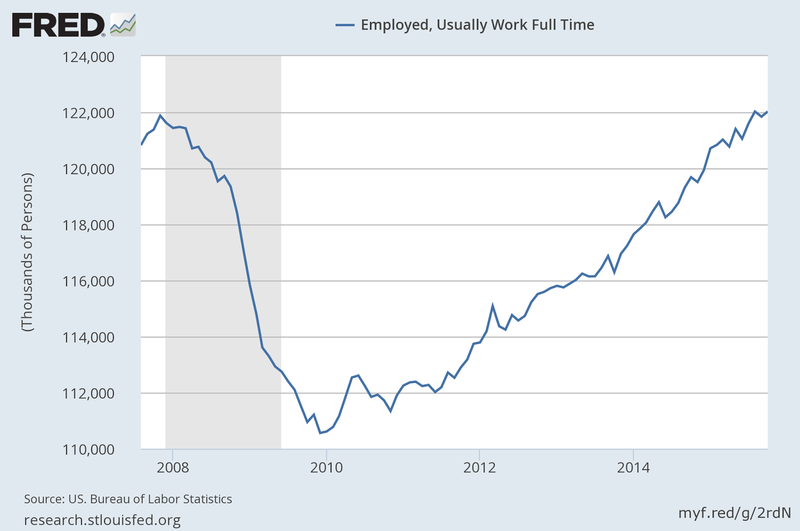 Full time employment finally above previous peak! 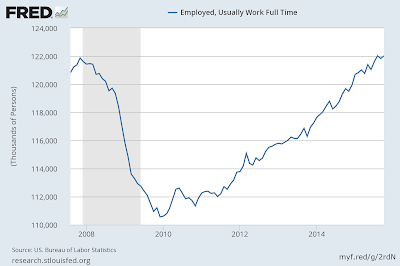 By the way, if you count workers employed full time only in August this year we surpassed the December 2007 peak, and after a fall in September, we're over again now. So it took only about 8 years to get back were we were. Yes, the economy is peachy. New Employment Situation Report is out. Not bad, given the last couple of months. In October, total nonfarm payroll employment increased by 271,000 and the unemployment rate is at 5%. 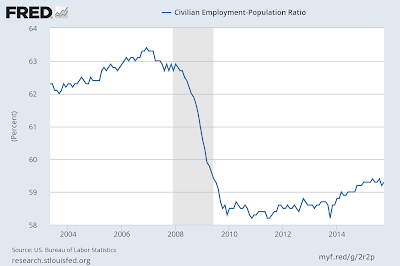 The employment-population ratio, which seemed to start to inch up last year, however, now looks again stagnant. 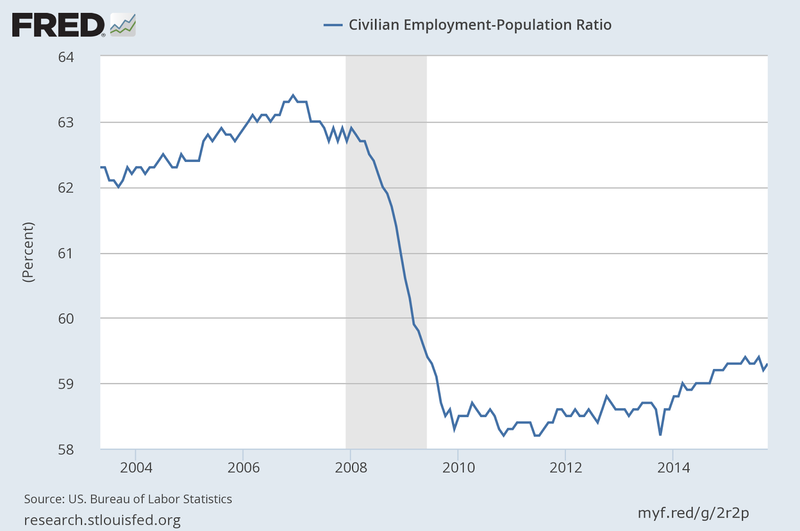 Even though it seems markets are happy with job creation above 200k per month, we need something more like 400 for a healthy recovery, and to bring the employment-population ratio up. Earnings have inched up a bit. The danger here is that Yellen and the FOMC use this to really start hiking interest rates by December, after all she says she thinks "the economy is performing well." The question of course is for whom it's performing well. 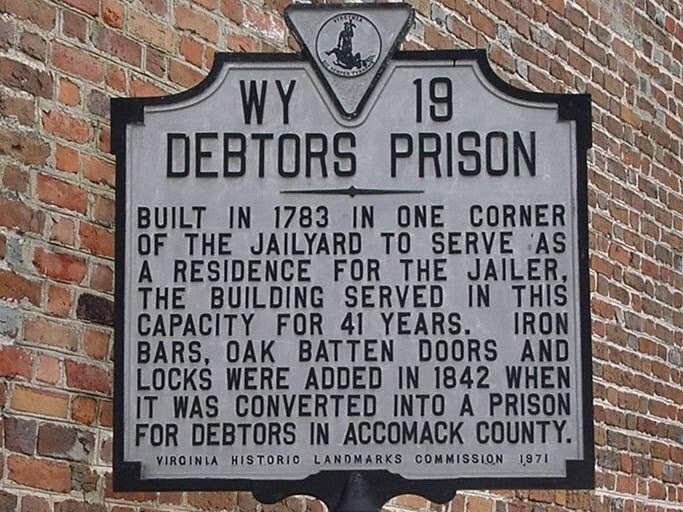 Recently NPR had a story about the criminalization of poverty in the US, and the fact that now poor people that get a parking ticket and the fees that go with that for processing, for court expenses, and what not, may end up in jail. At least now a series of lawsuits are challenging this kind of abuse. As I noted before I've been teaching a Political Economy course, which I assumed right before classes began, and, I decided to keep the textbook, since it was already ordered. The book is written by Bowles, Edwards, and in the last edition, Roosevelt and is titled Understanding Capitalism. I discussed before the meaning of capitalism here (see also this on the use of the term capitalism as a proxy for free market policies). Here just a brief comment on the use of the idea of modes of production (economic systems in the textbook). The book discusses the economic system in the US from colonial times to the present and suggests that it was not capitalist early on (it even says that no economy ever started as capitalists).While it is true that settlement colonies are not like exploitation colonies, I find this proposition hard to defend. Caio Prado Jr. one of the early Marxist analysts of Brazilian economic development noticed that Brazilian economic development was in effect from inception a footnote of the development of mercantile capitalism in Western Europe, and even though slavery predominated early on in the sugar plantations from the 16th century onwards, the system should not be seen as pre-capitalist, as some other Marxist authors suggested. Mutatis mutandis, the US was constituted to export tobacco to the old continent (colonization started in Virginia, not with the Puritans in Massachusetts, in spite of myths of origin). But more importantly even in the settlement colonies, were Bowles suggests that a system of independent production of commodities dominated, the famous triangular trade is what allowed the region to subsist. Again this suggests that the system was heavily dependent on the institutions of mercantile capitalism. Not completely clear to me, but certain passages in Bowles book seem to suggest that he also does not consider slavery as part of capitalism. This might be in line with the kind of argument put forward by authors like Eugene Genovese, which I discussed here before. Again, I tend to think that this is a misconception. In other words, the US economy (not the pre-Columbian societies that it displaced) was, as a much as the Brazilian economy, a footnote on the history of the development of Western European Capitalism, and very much part of that mode of production always. The book also seems to accept to a great degree the Coase/North New Institutionalist arguments about the role of property rights. This seems in line with the behavioral preoccupations of the book, and with Bowles notion that outcomes should be derived from microeconomic behavior, emphasizing the role of incentives. 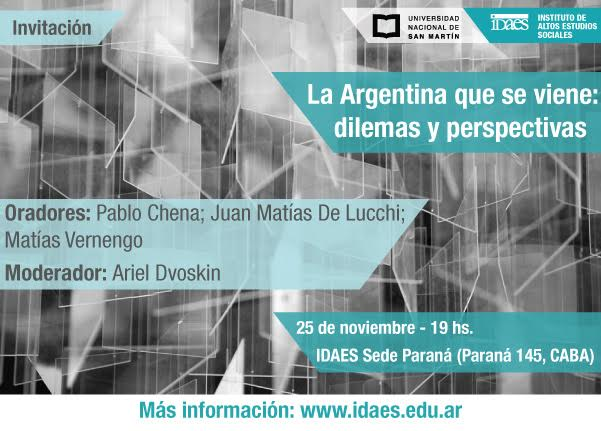 PS: There are other issues with the book that I find problematic, and perhaps will discuss in other posts, in particular the notion that employment is determined in the labor market and the use of an efficiency wage model as a political economy approach to labor issues. I quite never understood why this Marxist literature on efficiency wages does not cite Solow (they do cite Leibenstein) or other New Keynesian authors that basically present the same theory. Also the discussion of profits seems to suggest that accumulation is driven by supply side factors, rather than demand, although that should not be a surprise. The last one is not surprising though.